Editor's Note: Robin Oppenheimer will present a longer version of this paper, interspersed with rare clips and documentation, on Saturday April 18th at 8pm during Aurora Picture Show's annual Media Archeology Festival in Houston, Texas. Psychedelic light shows are the focus for this year's festival, which is curated by Bree Edwards. Click here for more information about the Media Archeology Festival and a schedule. In 1965, multimedia artist Stan VanDerBeek wrote that "language and cultural-semantics are as explosive as nuclear energy. It is imperative that we (the world's artists) invent a new...non-verbal international picture-language"1. He foresaw that future “image-making” technologies would be needed to develop a new “picture-language” to communicate to all people the threat of global annihilation. I believe that psychedelic light shows originating on the U.S. West Coast in the 1950s were part of the beginnings of this rapidly developing world language that is now more evident with newer digital media technologies. Along with other counterculture activities such as taking hallucinogenic drugs, light shows evolved as a means of connecting people and helping raise individual and collective consciousness outside the mass media spaces of TV, cinema, and radio. They were among the first primitive attempts by artists to appropriate many of the “new” analogue communications media technologies - photography, film, audio - and add the images, beat and lyrics of popular culture and music to create an immersive mediated environment embracing both the performers and the audience in a transformative sensorial experience. The light show artists I’ve met and researched tell great stories of how they could feel the people dancing in the room responding collectively to the music and their projections. As pre-electronic media folk artists, they learned quickly that they could tap into the group consciousness of their audience by improvisationally connecting layered collages of images both abstract and representational to the lyrics and rhythmic beat of rock and roll. The immersive, mosaic quality of light shows, when mixed with drugs and loud music, provided a powerful means of altering one’s consciousness and connecting to new ideas and ways of seeing the world that were outside mainstream media. My essay will provide a brief overview of the histories of West Coast light shows, with a focus on my original research into Pacific Northwest light shows. It will also connect light shows to larger contemporary art histories that include the avant-garde art scenes on the East and West coasts. I will demonstrate how light shows emerged in the early 1960s out of the powerful confluence of new ideas in science and the arts and alternative lifestyles that defined the West Coast counterculture. One of Locks’ students, Elias Romero, became the early Johnny Appleseed of light shows. As San Francisco’s beat movement transformed into psychedelia, Romero took his projection ideas and used them within this new context. Romero would use liquid projections and film to create an environment for poets, dancers and other performers. Together with Bill Ham, his landlord who was an abstract expressionist painter, they are generally recognized as the original creators of the traditional San Francisco light show. 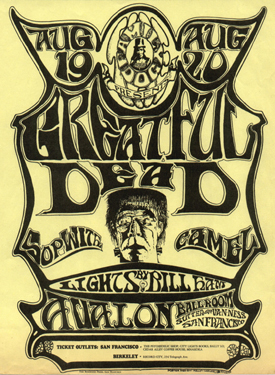 San Francisco light shows also quickly spread to Portland, Seattle and other cities around the world as young artists and other creative types experimented with lights, colored gels, and projected films and slides to accompany touring bands such as the Grateful Dead. In Seattle, two light shows, Lux Sit and Dance and the Union Light Company, exemplified the distinctively different East and West Coast light show aesthetics. The first light shows in the Seattle area occurred on November 5, 1966, when KRAB radio held a benefit concert. It was this event that birthed both the Union Light Company and Lux Sit and Dance light shows. Lux Sit and Dance was founded and organized by visual artist Don Paulson in January 1967, taking the name of ‘Lux Sit,’ (Let there be light in Latin) from the University of Washington Seal. Together with Dance, the title’s acronym was LSD. Paulson had attended Warhol and the Velvet Underground’s first public performance together in New York at the Cinematheque on February 8, 1966. It was a prelude to the “Exploding Plastic Inevitable” light show that Warhol toured around the country that featured blinding strobe lights, projected Warhol films, and live music by the Velvet Underground with simulated sadomasochistic rituals performed by Nico, Gerald Malanga and other Factory regulars. Paulson incorporated this “hard edge” East Coast light show aesthetic into Lux, Sit and Dance by using white strobe lights along with colored lights. The ULC’s light shows are incredibly dense collages. A recently-produced video recreation of a ULC light show accompaniment to a Country Joe and the Fish song "Superbird" with lyrics about Vietnam and President Johnson going back to his ranch shows images of Johnson’s face superimposed over faces of Vietnamese children. There are also Mickey Mouse cartoons juxtaposed with soldiers marching, collaged together with colored lights and geometric patterns formed by glass plates placed on overhead projectors. These montaged images were manipulated live, by hand, from multiple projectors, and form intense kaleidoscopic effects. At a live presentation at Seattle’s Experience Music Project in 2004, ULC’s Ron McComb sayed they were looking for an antidote to the barrage of mass media images they experienced on TV everyday. Their work exemplifies VanDerBeek’s “new picture language” made to combat the mainstream media messages and help raise the consciousness of the audience. Forty years later, light shows have remained stuck on the fringes of popular culture and the art world. They represent a unique conjoining of disparate elements that link the worlds of art, science, technology, popular culture, and communication. They are grounded in the psychedelic experience of what Whitney Museum curator Chrissie Iles, and others before her, call synaesthesia, “in which the body is perceived as becoming at one both with others, with the sounds and images experienced, and with the surrounding architectural space.”13 Today we find ourselves in an ever-expanding electronic media form of synaesthesia, where we are increasingly immersed in an aurally and visually saturated media culture that was identified forty years earlier by light show artists. This late 20th century re-emergence of the original intent of light show artists to manipulate and recontextualize images and sound reinforces our ever-increasing need for individual intervention into the pervasive forces of mostly commercially-driven mediated messages. I believe that West Coast light shows represent a significant multimedia folk art form that was the primitive beginnings of ever-increasing attempts by artists to master the ever-expanding mix of 20th century communications media technologies in order to raise the collective consciousness of the audience rather than sell them something. Light shows just might be the beginnings of what filmmaker Jonas Mekas, in his 1964 Village Voice article, called “the absolute cinema, the cinema of our mind.”15 They can begin to show us how to tune in to the powerful forces of change and chaos by making them visible from the inside of what Tony Martin calls a “dynamic…joining place” of heightened inner awareness that connects to the universe. They might just show us how to begin to speak VanDerBeek’s picture language in order to help transform our collective awareness and begin to reverse the destructive forces threatening our civilization and our planet. 4. Charles Perry, The Haight-Ashbury: A History (New York: Random House, 1984) p. 37. 7. Bernstein, D., editor, The San Francisco Tape Music Center: 1960s Counterculture and the Avant-Garde (Berkeley and LA, U. of CA Press, 2008). 8. 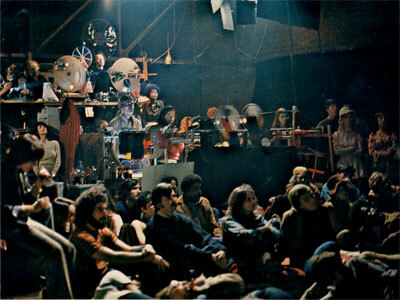 Tony Martin, “Composing with Light,” in The San Francisco Tape Music Center: 1960s Counterculture and the Avant-Garde (Berkeley and LA, U. of CA Press, 2008), p. 145. 11. Don Paulson, unpublished manuscript, 2001. 12. Based on author’s interviews with Carol Burns and Ron McComb, 2000-1. 13. Chrissie Iles, “Liquid Dreams,” from Summer of Love: Art of the Psychedelic Era catalogue edited by Grunenberg (London: Tate Publishing, 2005), p. 70. 14. Lon Clark, Power to the Pupil (San Francisco: xlr8r magazine, 2001). Robin Oppenheimer is an internationally-recognized media arts consultant and scholar who has worked in the field since 1980. She was the Executive Director of 911 Media Arts Center in Seattle and IMAGE Film/Video Center in Atlanta, where she also directed the Atlanta Film & Video Festival. In addition, she has produced numerous large-scale media arts projects, curated video art exhibitions and festivals, and written about the media arts. As the first (and only) Media-Arts-Historian-In-Residence at the Bellevue Art Museum in 2000-02, she researched and produced an exhibition about the history of the experimental Bellevue Film Festival (1967-81). She also researched and helped produce the Experiments in Art and Technology (E.A.T.) Reunion Symposium at the University of Washington in 2002. Based in Seattle, she is a Lecturer in the Interdisciplinary Arts and Sciences program at the University of Washington Bothell campus. She is also a Ph.D. candidate in the School of Interactive Arts and Technology at Simon Fraser University in Vancouver, Canada, where she is researching the historic creative collaborations between artists and engineers in the 1966 “9 Evenings: Theatre and Engineering”. Wonderful to see these gems of your research online. I look forward to reading the whole thing! I helped build and operate Cerebrum - NYC'68,'69, and was Lighting Director - FillmoreWest'70-72. Your research is much appreciated by one who played the mystic lights, thanks for the context. Played with Lux Sit on several occasions in 1967. One of those occasions was the show at the Eames Theater at Seattle Center for the Seattle City Council which resulted in lifting the ban on light shows. Eames Theater may have a different name today. It is a 360 light show canvas. City council members were plied with alcohol and then the strobe light came on and I remember the straight guys in white shirts and ties dancing with their arms extended. It was quite a moment in Seattle history. Lux Sit did a show in Bremerton Wa on June 6th, 1967 called the "Changing Times Festival" featured song writer Ron Davies, local song writer legend. Chymes of Freedom was the highlight of the show. See them on PNWBands.com or something like that. We did a punk rock comedy TV show on TIME WARNER CABLE Televison FOR 5 Years in ITHACA New York. "THE DESTUCTIVE IMPULSE SHOW" We had alot of fun got paid no money and The main character "Raph the great" Decided he had had enough of it and quit 2 times. The show took a break for a year Raph went to San Francisco and many other places While I remained in the area. We put the show back on the air "LIVE" a second time another Raph travel adventure then on the air again. My intention All along was ART! I still have the original studio VCR tapes and plan on Using it. The matierial is amazingly authentic as there was no ego. Raphs intentions was not to become rich or famous. There is alot more detail that I will not go into now, I need collaboration of more Artists and musicians and support and some meager finances from a sponsor or a supporter to Go forward. THIS would make an excellent project for a grad student to persue Or maybe even something bigger! I'm not very good at "schmoozing" my way into things. There is a huge potential here When you compare it to other successful endeavors i.e. The Sienfeld TV series? Any help or input would be appreciated sincerely "bABYLon joHN" John McARDLE. THANK-YOU. (bows humbly) Thank-You RHIZOME and ALL who appreciate aRT/Culture/Music. FEEL free to contact me or comment as you see fit.